Whether you prefer bargaining for traditional goods in an outdoor market or browsing luxury offerings in a modern mall, Cabo truly has something for every shopper. This shopping paradise abounds with artsy boutiques, souvenir shops, purveyors of fine clothing, beautiful jewelry, art galleries and local crafts. In Cabo San Lucas, offerings run the gamut from inexpensive knickknacks to the finest in high-end merchandise. Browsing by foot is easy in the lively downtown shopping district near the marina, including the Puerto Paraiso and Luxury Avenue malls. Tranquil and artsy, San José offers plenty of choices in the historic downtown area for a day of relaxed shopping. Many of the shops are centered in the area of the main plaza and church. Specialty boutiques feature one-of-a-kind treasures. The lovely architecture, charming ambiance and small cafés will make your shopping trip pleasant and memorable. 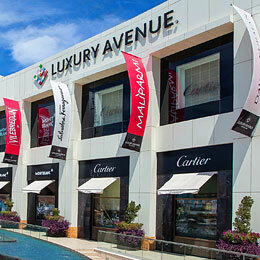 Head to Luxury Avenue to browse offerings by well-known designers and brands. Located alongside the Cabo San Lucas Marina, this luxury boutique mall offers a well-curated selection of clothing, jewelry and accessories. Among the brands, you’ll find: Ultrajewels, Ultrafemme, Tous, Salvatore Ferragamo, Swarovski and more. Shop for unique treasures, hot fashions and great gifts to take home. Note: In June 2008, Mexico began reimbursing the IVA (value-added) tax charged on purchases made at stores and businesses throughout the country to tourists who arrive by air and cruise ship. Tourists are able to use kiosks at the Los Cabos airport to reclaim the tax they've paid on goods totaling at least $115 (1,200 Mexican pesos). In order to qualify for the refund, the purchases must have been made at approved stores and businesses with credit cards or debit cards issued outside of Mexico, or in cash. Tourists must present their passports when making their purchases and obtain a receipt and an official refund form from the approved merchant. The tax credit will apply to shopping, not to purchases on meals and lodging. Visitors will be able to get half of the VAT in Mexican pesos, up to a maximum of $955 (10,000 Mexican pesos). The rest will be credited electronically to visitors' credit cards or bank accounts within 40 days.